I really hate to have to write anything negative about Filipinos and the Philippines. Unfortunately, sometimes it is necessary. I would like to warn people about hiring a kalesa in Manila to tour around the Malate area. 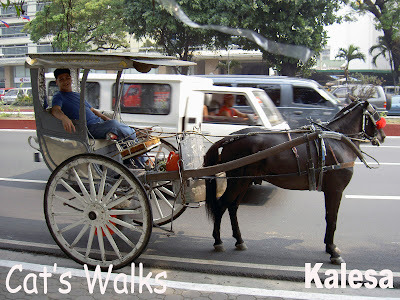 We hired a kalesa last year in Malate because we thought it would be fun to see the city with it. We agreed with the kutsero or "driver" that the trip would cost 300 php for 1 hour. Okay, that seemed fair. Because I was pitying the horse and I wanted the driver to be able to feed his horse well, I didn't argue so much about the price. Well, halfway through the trip his whole attitude changed --he stopped being friendly. He said that the price is actually per person (so it's 900 instead of 300 because we were 3). I started to feel very uncomfortable. With my husband we argued with him that it was not the price we agreed upon. We just then asked to be let at the Robinson's Mall without finishing the 1 hour trip (we rode for only 15 minutes, actually). At the mall, he argued that the mall is not part of the trip so we have to pay extra. I felt that he was really getting worked up and I felt threatened. We were in a public place so I was not really really afraid of what he can do to us. I gave him maybe 400 and then walked away (I was pitying the horse). The author of My Egg Noodles had a worse experience riding the kalesa on their first day in the Philippines. At the end of their tour, another guy hopped in and then they were brought to a dark alley to be harassed for money. I am really disappointed that this kind of thing happens. If the Department of Tourism really wants to increase the number of tourist going to the Philippines then somehow this modus operandi should be stopped. Note: The picture of the kutsero in the kalesa above is not the guy who harrassed us. Nice blogs and have a good written on your blogs.Why not checkout about Borneo tourism. Thanks for your nice comment! Please drop by offen. I miss riding kalesa at manila. but when i saw those horses i feel sad cause i think they are getting tired. Sigh, such things are one of the few complaints that I here from the local friends here in Singapore whom I urge to at least consider and visit the Philippines for vacation (besides the media here which likes to paint Philippines as a unsafe and chaotic country for a tourist). Sigh. Don't worry. Bad things like this happen in every country. I think by blogging about it, we make people aware of the things that should be changed or improve. Continue telling your friends to visit Philippines! its okay to tell the truth. well this maybe the most stupid story, I am filipina and 26 years old, MY boyfriend (swedish-korean) and I visited the Philippines last dec 2008. We were in Pedro Gil and on our way to my lola whose residing in Cavite. A Kalesa passed by and the driver said that we could take a ride until Baclaran for only 100 I understood it as 100 pesos because I heard that they take only 10 dollars for a ride. I was thinking to give them more later because maybe thats why the diver gave us a low rate because they could not find any passengers! When we were in Baclaran I gave him 500 pesos and he said "no ma'am it's a 100 dollar per person. We were really shock I said I don't have 200 dollars and we just misunderstood each other. I didn't know what to do. I was so ashamed for my bf because how could be a filipina like me be swindled by my own countryman. We were talking in swedish, he told me that those guys are not to be trusted. We had no choice, the other guy was sitting on the stair so there was no way out. So I gave him 80 euro just for them to let us go! I was so ashamed because I was too stupid to just step on their trap. In my own country, a filipino treated me like that. It's hard to forget, almost never want to share this but I needed so the people out there will be aware, if I have read your story before I would have be aware. I realized that reading others comments even if its nice or bad can help you in your travel and living!